Terry Davis served as the Group Managing Director at Coca-Cola Amatil Limited (CCA) from November 2001 to March 2014. He joined CCA in November 2001 with 14 years' experience in the global wine industry. During his time as CCA, as a result of the technology focus and extensive commitment and investment in customer service improvements, the company outperformed the ASX 100 index by two and a half times and return on capital employed went from 7.6% to over 22% p.a. in his last year as CEO. Prior to CCA he worked for the Fosters Group in various positions including Managing Director of Beringer Blass Wine Estates (the wine division of Fosters Group Ltd) serving as Managing Director for Australia at Mildara Blass Limited from 1999 to 2001 and Managing Director of Cellarmasters Wines Pty Limited from 1987 to 1997. 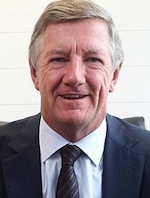 He has been an Independent Director of Seven Group Holdings Limited since June 2010 and is a board advisor to Visy, one of Australia's largest private companies. He served as Director of St George Bank Limited from December 2004 until its sale to Westpac in December 2008. He was a member of the University of New South Wales Council from 2006 to 2014 and also served on the its Faculty of Commerce Advisory Board prior to that. A strong believer in encouraging executives to develop interests outside of work, he is a keen deep sea and fly fisherman, an average golfer and has won 10 world masters rowing titles since returning to competitive masters rowing in 2006.